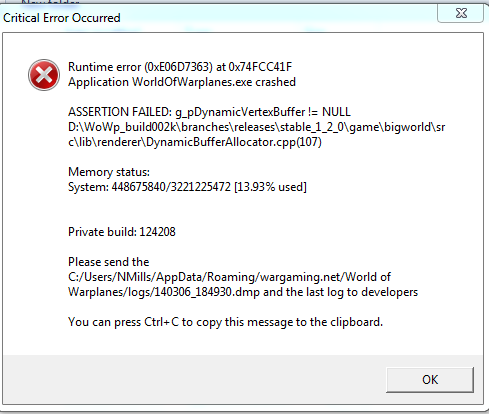 I get this error when I try to load the game with hryunometr mod. Excuse me for losing my temper but I dont deal well with smart@ss comments when Im trying to find answers to things that I know Im doing right by the directions that are given. Maybe I should have been more specific as I wasn't downloading YOUR mod and wasn't singling YOU out as I have seen many mods with no instructions whatsoever. And this is the Hryunomod thread not YOUR XVM thread and many people are having issues with this particular mod. However, you stated you're needing instructions for the mods that we put up.. generalizing the mods was done by you, not myself. With update 1.2 making lots of different changes, we're all working feverishly to figure it out. Once we can successfully collaborate together on this, I am sure that we will all share this information with everyone else. Again, nobody was smart with you. YOU were snide and snarky with us. Edited by RocketSpammer1, 07 March 2014 - 01:27 AM. 3.51-5 : I consider these players to be a significant to dominating threat to our team. If they're in a GAA, I will hunt them... especially if I'm also in a GAA. GAA that do anything other than kill ground targets or fire at passing air targets... Dont need to be playing GAA. Don't waste everyone's time by being Anything other what your craft was meant to be. Your teems fighters will take care of the GAA if they have any skill at all... but actively hunting GAA is every moment you are not spending gaining supremacy for your team. Edited by NemesisStar, 07 March 2014 - 01:32 AM. Only the weak die, the rest of us go to Cuba to chill with Tupac,Elvis,Kurt and Micheal. You are wrong. Any air to air kill is a point for your team. It's easy to get back to a ground target if you need to catch up on supremacy. It's not easy to catch up on supremacy if you died because you went straight to enemy GTs and kept pounding away. As you gain more experience in World of Warplanes, you will learn that the most effective Attack Aircraft is one whom actually attacks with their team... so long as they're conscious of the supremacy count. Edited by RocketSpammer1, 07 March 2014 - 01:43 AM. Edited by C00li0, 07 March 2014 - 06:14 AM. Please, could you answer to this. First thanks for your work and for adapting it for others servers (i'm on EU). Secondly, you give a list of command for the cfg, but i don't know the syntax for each, for example i would like to use the bigmap, but don't know how (i know nothing about python). hi, now prepared a description in English for radar config file. in future versions of the mod will be added to customize some display options. It's not python, it's just a simple config file. Take a look at the exemple in the first message of this topic. For instance, to enable "bigmap", you just have to write "yes" instead of "no" next to it in your fmt_radar.cfg. You can edit it with notepad. Edited by hryuun, 07 March 2014 - 06:04 PM. While I applaud the author's investment of time, creativity, energy, and love for WoWP in making this mode.....I am concerned. I cannot but think that this promotes head-hunting; by head-hunting the best players (who are usually loyal and repeat buyers and spenders of Gold) will encourage some to only fly in flights of three and thus ensure more aggravation for the average players AND drive some other top players to abandon the game, which will reduce WG's revenue. I hope WG implements a start screen that shows the planes of the opposing team, but not the names which also prevents mods like this on from working UNTIL individual players are spotted; this seems the best compromise to me for mods which identify potential player performance in battle. Again, excellent work on the mod hryuun and I hope you continue to develop, refine, and support your creation! Edited by von_Krimm, 07 March 2014 - 05:42 PM. A fog of war would be nice, this is how Clan Wars and Special Battles happen in World of Tanks, You do not know how there are on the other side, you do not know who they are even what they are bringing until they are spotted. Times I wish this was implemented into Standard Battles for WoT and would be useful for WoWp also. vk, head hunting already happens. No offense, but headhunting happens a lot already. Especially by some of the people complaining about it. Also, it wasn't all that long ago that you, VK, told me that a fog of war such as this should NOT be implemented. Am I to understand that you have valid reason to change your mind all of a sudden? My thread on getting UI/skins/XVM to work explains what I had to do. I was, in fact, using your newest version. I analyzed your PYC files after decompiling them. Then stop being so good! I did see one major issue though... The Hawk III does not show up in the carousel but it will show up in the hanger when you click on it on the carousel. It also shows up just fine in game, including a Nationalist Chinese skin I'm using. I do need to figure out how to get my radar back, but I'm sure the instructions are early in the thread. Finally, it does seem to load me into the battle slower, but the game runs smoother, although that may be WG's doing. All in all, I like the mod. I think his color coding is backwards. He has the higher rated as reads such as those with 5+ whereas those with 1+ are darker colored. I like Alex's color pattern. Is it possible to get that?